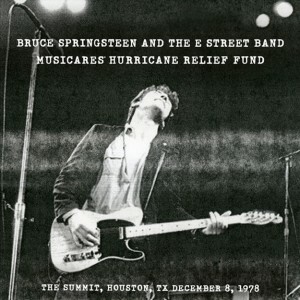 THE SUMMIT, HOUSTON, TEXAS, 8 DICIEMBRE 1978. Gira Darkness On The Edge Of Town. Grabado por Bruce Jackson. Remasterizado por Bob Ludwig﻿. ﻿Los beneficios de este concierto se destinará a la asociación MusiCares Hurricane Relief Fund, en apoyo a las víctimas del huracán Harvey que azotó Texas y sobretodo en concreto Houston. Se trata del concierto de Houston de la gira del Darkness que Bruce incluyó en la caja The Promise en forma de video y blu-ray y que ahora se podrá disfrutar en audio con sonido oficial..
Captura la última etapa de la gira del Darkness, incluyendo la versión con intro de "Prove It All Night", las raras "Streets Of Fire", "Fire" y "Because The Night". También cuenta con primeras apariciones de "Independence Day", "Point Blank" y "The Ties That Bind" del futuro entonces doble álbum "The River". Además de una rara canción en septiembre: "Santa Claus Is Comin 'To Town". It is nearly impossible to find a Springsteen fan who doesn’t revere the Darkness tour. Those who witnessed one of its 111 shows in person speak of it in language typically reserved for religious conversion. Happily for the the rest of us, either born or converted after January 1, 1979, the palpable sense that Bruce and the E Street Band were laying it all on the line every-single-night is remarkably well preserved in the live recordings, from the official download of the Agora in Cleveland, August 9, 1978, on through the various audience tapes, radio broadcasts and soundboards in circulation among fans ever since. Our insatiable appetite for the Darkness tour and a truly worthy cause make the audio release of Houston, December 8, 1978 most welcome. Many will be familiar with the show from its inclusion as the live DVD in the 2010 Darkness box set, but this download marks its first release in a more user friendly, audio-only edition. And the show warrants re-appreciation. A big source of that deep and widely held love of the ‘78 tour stems from the fact that five incredible concerts were broadcast on the radio regionally: The Roxy in Los Angeles, the aforementioned Agora in Cleveland, the Capitol Theater in Passaic, the Fox Theater in Atlanta and Winterland in San Francisco. Hundreds of thousands of fans have been listening to recordings and bootlegs of the ‘78 broadcasts for nearly 40 years, to the point where they are as familiar with those performances as they are with the Darkness album itself. Myself, maybe more so. Justifiably, all five are held in extremely high regard as some of the best shows Bruce and the band ever played. The Houston show was never available as anything but an incomplete, mediocre audience recording until the DVD. As such, it lacks the kind of decades-long familiarity that makes the five radio-broadcast shows so legendary. But Houston stands strong on its own merits as a fantastic and vital show representative of the tour’s final leg and boasts an outstanding setlist and performance to match. The city has had a long relationship with Springsteen, as one of the first markets outside of the east coast where he found a following before Born to Run. Bruce is well aware of that history during the show, name-checking Liberty Hall, site of a mini band residency in March 1974, before a scorching “Saint in the City,” and adding the unreleased early burner “The Fever” to the second set. Those are but two of the highlights in a 27-song setlist packed with them. A look back to ‘74 is complemented by a peek into the future as Springsteen plays what at the time were three unreleased songs from his next album, The River, opening the second set with “The Ties That Bind,” after playing “Independence Day” in the first, and adding an unsettling “Point Blank” later in the show. You’ve watched the Houston show before. But have you listened? This release gives us all a chance to do so again with fresh ears and revel at Bruce and the E Street Band at the peak of their powers in 1978.